Is it the weather? The excellent produce? The relaxed culture? An aversion to the harsh "real world" of the East Coast? Measuring three years and 300 million tweets, the scientists used a rating system called Affective Norms for English Words, which rates individual words for their indication of happiness. The survey is, of course, not much more than a wild guess. It assumes Twitter users are representative of the population as a whole, which is debatable, and disregards that one is often inclined to use Twitter when in a particular mood. But that doesn't mean some of the trends aren't interesting, and it doesn't mean it's not a fun survey. 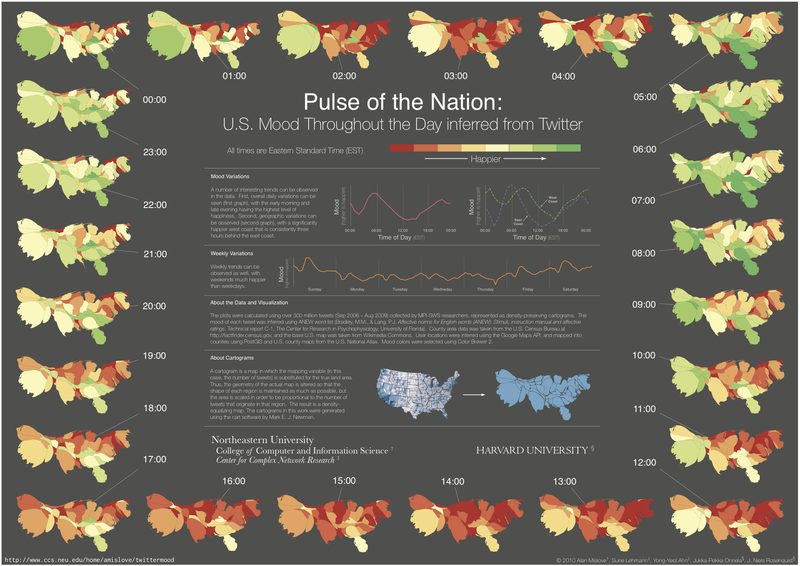 Mood showed distinct variation based on both geography and time of day. Early morning and late evening are the happiest times for denizens of either coast (and, I suppose, those somewhere in between), with the West Coast being three hours behind the East Coast due to time zone difference. Thursday night is the lowest of the low point, while, interestingly, Sunday morning is the happiest time of the week. As an East Coast expat now living in San Francisco, I'm not sure where to fall on this issue. The Pennsylvanian in me thinks East Coasters are tougher, more realistic, more willing to see the world as it is. But as a recent convert to San Francisco life, I feel like life is good out here: The weather's perfect, the food's good, and life moves at a manageable pace. The part of me that lived in Chicago for two months feels left out.